I agree. Just because one has the ability to drive doesn’t mean one SHOULD drive with abandon, even with a highly efficient car. That said, sometimes driving is what needs to happen in a given situation. I’m all about balance when it comes to driving and not driving … and our car gets 35 miles to the gallon. Even so, I’m working on driving less. One solution for us, given we enjoy “road trips” to the mountains or beaches with our four big dogs (can’t really take them all on trains or on buses, darn) is that our work-week lives are extremely un-focused on driving. We intentionally bought a house in a walk-able neighborhood where we are near almost everything we need (grocery and pet and drug stores are just blocks away, coffee and restaurants are within blocks, and even our doctors are just a few miles away! ), we telecommute most days and I ride the bus and/or bike. I think our intentional work-life choices that de-emphasize driving help keep our drive-miles “in check,” when we choose to get in the car to go somewhere. We’re looking at adding a Prius or two to our fleet of cars used for learner drivers; do you think a Prius is a suitable car to learn to drive in? 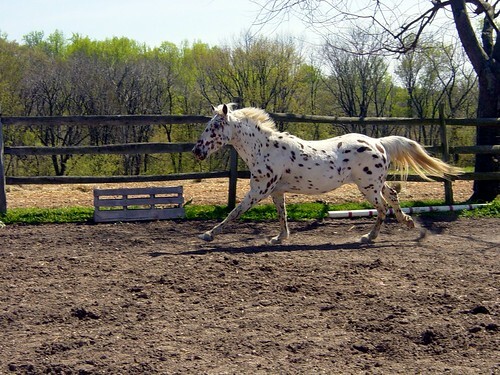 And the Appaloosa in the photo looks so beautiful. Interesting question. I find the Prius’s starting system and gear-shift so different from ‘mainstream’ cars that I’d think a person shouldn’t learn to drive ONLY in a Prius. On the other hand, I think that hybrids are the only cars with a chance of evolving into the future. So logically, any new driver’s education should include learning to drive a Prius or other hybrid. The constant feedback-loop the driver sees on its dashboard, i.e. 46 miles per gallon, sets a good expectation of fuel efficiency in the new driver’s mind. Thanks for the question. I hope you add the Prius to your fleet. Thank you. The starting system is one of the differences to other cars that’s delaying the decision. For – more people will drive hybrids so it’s better to get used to them. Against – a Prius would make learning to drive more complex than it is already. I think the next stage is to ask our students if they think it’s a good idea. With petrol costing almost $10 a gallon a Prius will make quite a difference to how much it costs people to learn to drive. We’ll keep you informed and thank you again for taking the time to answer. Besides the money, it saves emissions and builds friendships and community . . . . all a part of the Diamond-Cut Life.